Between two and three times as many asteroids have struck the Earth and the moon since the age of the dinosaurs, when one massive space rock collision wiped them out forever, researchers said Thursday. The mounting pace began around 290 million years ago, and likely coincides with some kind of large cosmic smashup in the main asteroid belt between the orbits of Mars and Jupiter, researchers reported in the U.S. journal Science. The result was space debris, some of which made its way to the Earth and the moon, leading to a rate of asteroid impacts 2.6 times higher than it was before 290 million years ago. 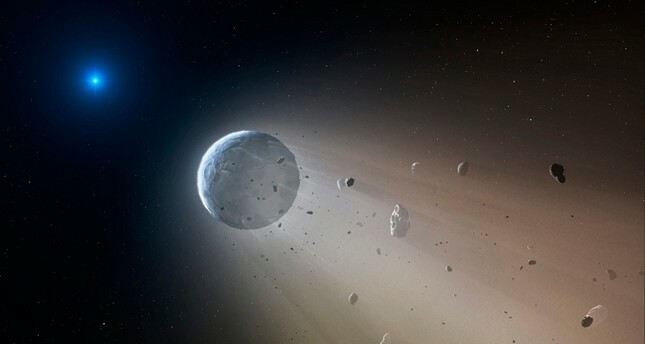 "These impacts send a shower of space rocks to the Earth, which will likely reach a peak and then decay with time," co-author Tom Gernon, associate professor in Earth science at the University of Southampton, told AFP. The study did not draw any direct lines between the ramp up in asteroid strikes and major life-changing events in Earth's ancient past. These include the Permian extinction some 252 million years ago when up to 90 percent of life on Earth was wiped out for mysterious reasons. A massive asteroid is largely blamed for the demise of the dinosaurs, which came into existence about 245 million years ago and disappeared 65 million years ago. "The question is whether the predicted change in asteroid impacts can be directly linked to events that occurred long ago on Earth," said co-author Rebecca Ghent, an associate professor at the University of Toronto's Department of Earth Sciences. "Though the forces driving these events are complicated and may include other geologic causes, such as large volcanic eruptions, combined with biological factors, asteroid impacts have surely played a role in this ongoing saga." "It's just a game of probabilities," said study lead author Sara Mazrouei, a University of Toronto planetary scientist. "These events are still rare and far between that I'm not too worried about it." Mazrouei and colleagues in the United Kingdom and the United States compiled a list of impact craters on Earth and the moon that were larger than 12 miles (20 km) wide and came up with the dates of them. It takes a space rock that's half a mile (800 meters) wide to create holes that big. More research is also needed to figure out how the pace of asteroid impacts has changed over the past 290 million years or so. So should people be concerned? "Not at all," Gernon said, noting that asteroid impacts are random events. Furthermore, the U.S. space agency NASA continuously tracks potentially hazardous objects -- known as Near Earth Objects (NEOs) greater than 30-50 meters (yards) wide, he said. Scientists have long been intrigued by asteroid strikes, and have tried to study the rate of impacts on Earth with limited success. That's because erosion on Earth causes some craters to disappear. But the moon is hit by asteroids about as often as the Earth, and shares a "similar bombardment history," said co-author William Bottke, an asteroid expert at the Southwest Research Institute. Scientists have gained a better understanding of the processes that shaped the moon since NASA's Lunar Reconnaissance Orbiter started circling it a decade ago. LRO's instruments allowed scientists to decipher the ages of various craters, and compare them to what was known about asteroids strikes on Earth. "The moon is like a time capsule, helping us understand the Earth," said Bottke.